Tired of spending tons of money on advertising to the masses where most of the people viewing the ads are not even interested in your service or products? How about targeting just those folks that would be interested in your products or services, with very little or no competition! Wouldn't that be nice for a change! 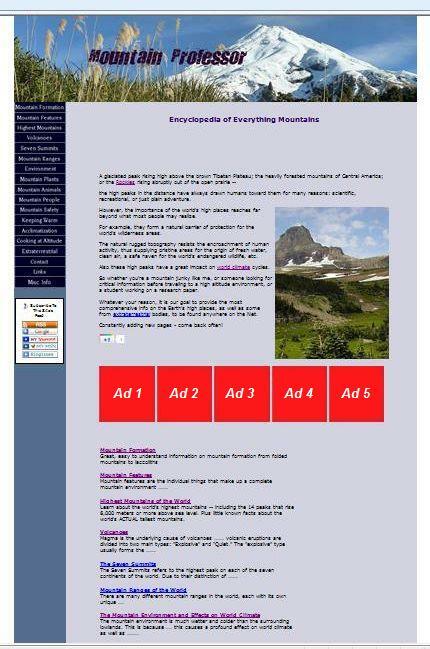 Mountainprofessor.com targets traffic specifically interested in mountain travel, trekking, climbing or learning about mountains, and has a global audience of more than 100 countries. We offer easy-to-understand information on mountain safety, mountain formation, lightning safety, dehydration prevention, hypothermia prevention, how to stay warm in cold mountain weather, and much, much more! This is a dynamic site and we will constantly be adding updates as well as new resources. Not only will you be advertising to potential customers, but also helping support an important online resource, free for everyone to use and enjoy. We are looking for sponsors specifically in the mountain travel industry, and who would like to share this site's valuable info with their visitors/clients, such as: Outfitters, outdoor clothing manufacturers, guide services, mountain lodges, mountain parks and attractions, etc.. There may also be one or two ads available for general merchandisers (such as those selling food or candy products). At the moment we are offering only 5 ad locations (on the Home page) for only 5 exclusive sponsors. With only 5 ad spots, your business gets top notch visibility. The reason we are offering only 5 locations (besides the visibility factor) is that we are very keen on keeping this site easy to navigate, uncluttered, and user friendly. These positions are available for a minimum contract of 6 months to as long as you want after that. However, payments can be made on a monthly basis. Payments are made through Paypal even if you don't have a Paypal account (major credit cards accepted). Ads will be about 140X140 pixels in size. See image below for location. • We reserve the right to decline any advertising inquiry that we don't feel would fit our site. • Prices are subject to change upon contract renewal due to market changes. Fill out the form below for more details on how payments are made as well as pricing.